As planned we got up early and had a quick breakfast before leaving the campsite. We can strongly recommend the National Park campsites. Good value at 120 pence per night, and we were able to plug into a socket and give the batteries a rest! 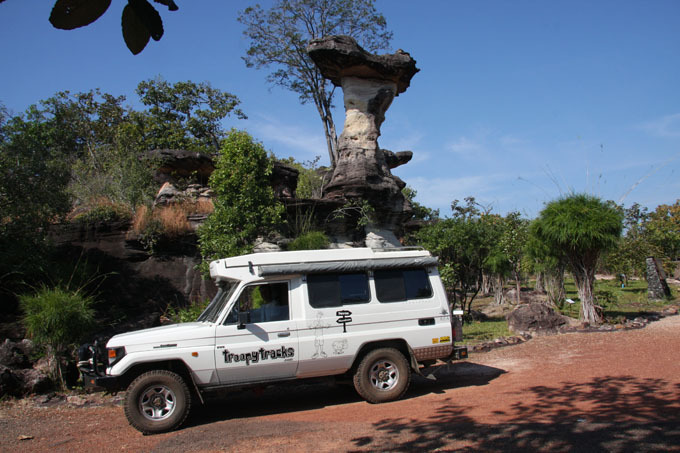 The visitors center is only about 2 km from the camping area and the car park for it is a big natural rock plateau. 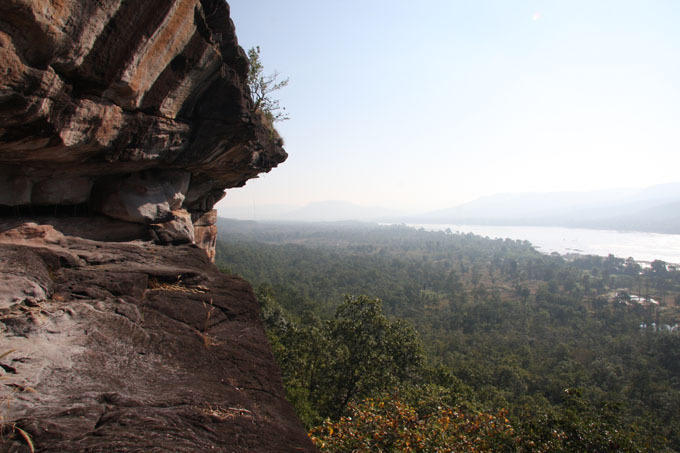 There is a circular walk of about 4.0km which takes in the rock walls and paintings dating back 3000 to 4000 years ago. The path down to the rock paintings can get slippery when it is raining as the signs point out. 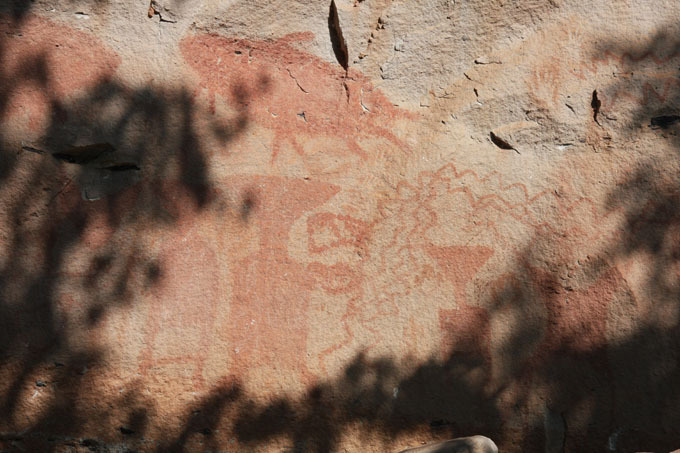 The paintings showed the life and the animals that were around at the time. The river was full of fish and tigers and elephants roamed the jungle. 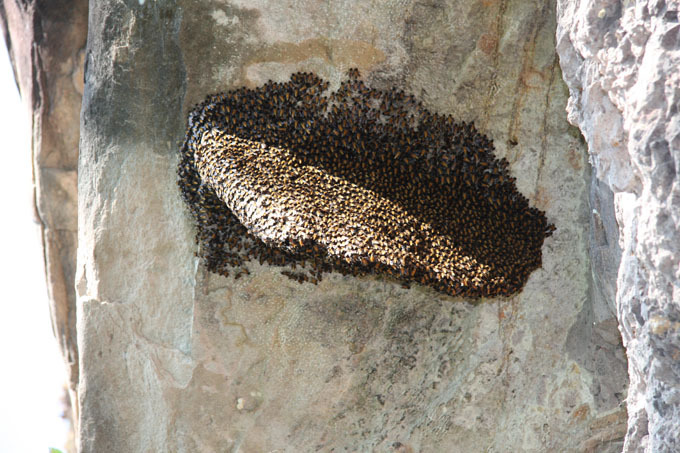 All along the cliff were wild bees nests. Even though it was only about 9.30 am it was already really hot when we got back to the car. We treated ourselves to a bit of icy cool aircon for half an hour as the car had been parked in the full sun. On the way out of the park we stopped of at another one of the rock formations for which the park is famous. After leaving the park we tried out the Garmin South East Asia routing. It had not worked in Laos, but here in Thailand seems to work a treat. 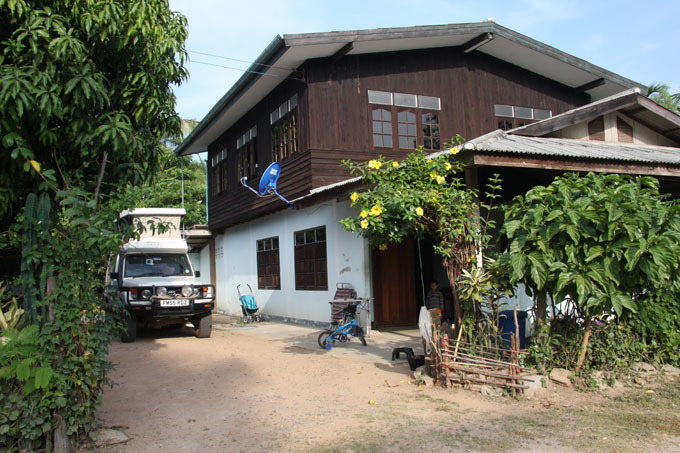 We were now on our way to see Nang and Austin in Tamnop, near Phu Sing. It looked as though, all going well, that we would be with them at 3.30pm. 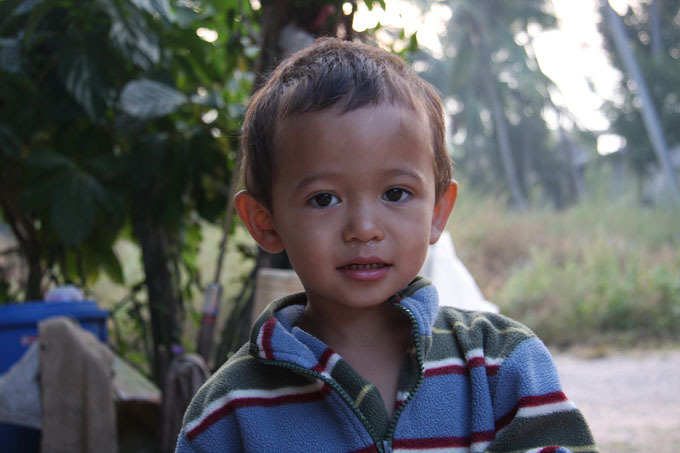 It feels strange to be visiting them in Thailand …. popping in on our way past! After a few stops to ask the way to the village, we ended up at Tamnop school gates. The kids all came out of their class rooms, and when we mentioned Austin, they wanted to lead us to his house. They all had beaming smiles and were saying …” farang, farang, farang” which means foreigner and is in no way an insult …. its just what we are! As always in Thailand people were incredibly friendly. Five minutes later Nang arrived on her scooter to lead us to her house. It was lovely to see them both. Austin had certainly grown! He was a little unsure of us for a while, but was soon back to his normal happy smiling self! Soon after we arrived we went off on the scooters to visit the family farm. It is about 3km along sandy roads. It is a lovely place and quite a few acres. 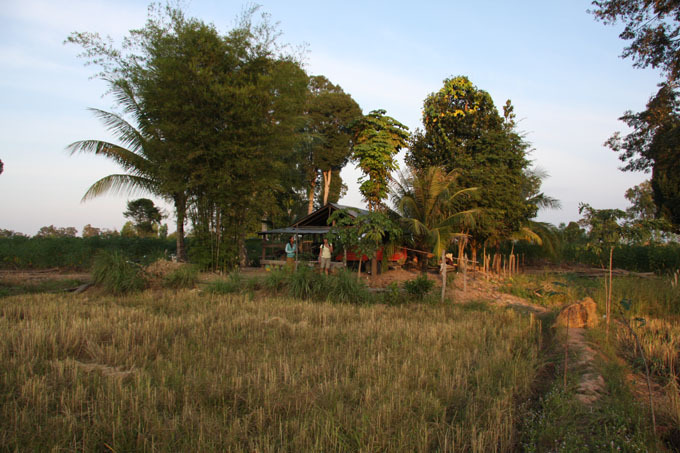 They grow various vegetables, rice and have 850 rubber trees. I think they produce about 30kg of rubber per day which they get 35 baht per kg for. Until recently they got 70 baht per kilo but costs have increased for pick up and transport to the processor. As often happens it seems that the farmer has to do most of the work and gets the smallest percentage of the profit. 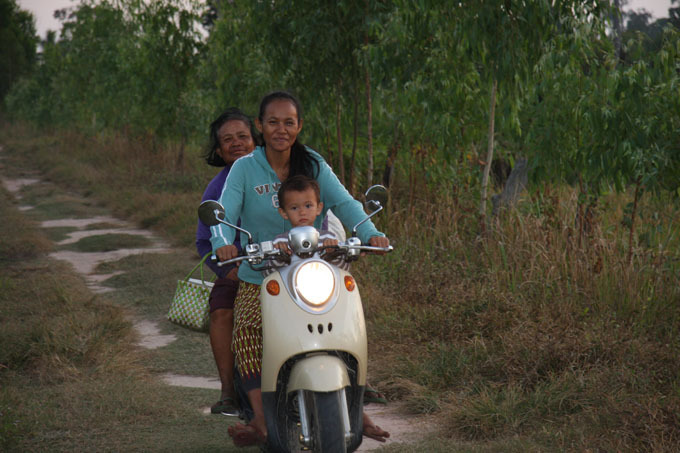 Once we had finished looking at the farm Nang picked up her mum, who had been cutting rice, and headed back to the village. We had parked Troopy between the house and the rice store, which was handy, but there was no breeze. It was still 30 degrees C at 9.00pm ….. and hard to sleep!